Mobile ad tech company AppOnboard has secured $15 million in Series A funding to develop its app demo tech. 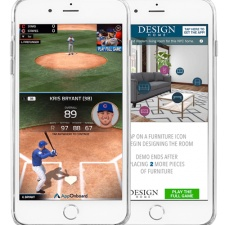 The California firm provides tools for for fully-fledged gaming experiences within an ad, letting users preview a title within a mobile game or app. AppOnboard hopes to use the latest funding to further develop the tech and get it into the hands of more studios. The company claims to have generated one billion interactions from its “full-fidelity demos” to date. The investment round was led by Korea Investment Partners and also included Mirae Asset Management, Mantaray, MTG, and Runa Capita. They join existing investors London Venture Partners, Troy Capital Partners, and Ophir Capital Group. The round brings total investment raised by the company to $20 million, after it previously raised $4 million in May 2017. “Opportunities to completely change the way mobile users discover content do not come around often,” said AppOnboard CEO Jonathan Zweig, who previously founded ads company AdColony. Speaking to PocketGamer.biz, AppOnboard Director of Business Development Katie Weinstock said that the company’s full fidelity demos are a mirror representation of apps and games, rather than being recreated through HTML. “Our goal is to allow users to try out an app or game in the highest quality possible and in a way that accurately shows what that app is like,” she said. The AppOnboard team currently consists of more than 40 people, but AppOnboard plans to expand to between 75 and 100 employees over the next 12 months across its product, engineering and commercial teams. Weinstock said the funding will help the company expand its growth plans globally and get its tools into developers’ hands faster. “Our demos allow developers to quickly iterate and create high-end, bite-sized versions that users can try in other mobile apps and games.